Mental Health Professionals are highly sought after in the military, especially after soldiers have spent extended periods deployed in combat zones. If you are a caring, compassionate person with the ability to listen, with interest in psychology, you may be interested in enlisting as a Mental Health Specialist, which is military occupational specialty (MOS) 68X. You'll have a direct and meaningful impact on the lives of the soldiers you interact with, many of whom struggle with mental health issues they did not experience before they joined the Army. For other soldiers, the stresses of combat may exacerbate existing mental health concerns. In any event, it's the job of MOS 68X to ensure soldiers get the treatment and counseling they need so they can be productive and healthy members of the Army. Soldiers in this entry-level position work under the close supervision of a psychiatrist, psychologist or social worker. 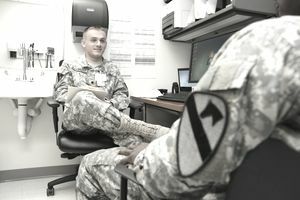 Although they're not doctors, mental health specialists are part of the Army's health care team that helps manage and treat soldiers in both inpatient and outpatient capacities. A big part of the job involves conducting the initial screening of potential patients. Job training for MOS 68X requires ten weeks of Basic Combat Training (standard boot camp) and 20 weeks of Advanced Individual Training (AIT) at Fort Sam Houston in San Antonio, Texas. This will include practice in-patient care, and the length of your training will depend on your medical specialty. This training will prepare soldiers to collect and record psychosocial and physical data and assist with the care and treatment of psychiatric, drug, and alcohol patients. The MOS 68X will also counsels patients with personal, behavioral, or psychological illness. You'll learn basic medical techniques such as CPR, and patient care and patient counseling techniques. The mental health specialist also assists professional staff with management and supervision of patient treatment programs, personnel matters, supply economy procedures, and overseeing a medical office. To be a mental health specialist in the Army, you need to score at least a 101 on the skilled technical (ST) portion of the Armed Services Vocational Aptitude Battery (ASVAB) tests. This score is determined from the general science (GS), verbal expression (VE), mechanical comprehension (MC) and mathematics knowledge (MK). You won't need a Department of Defense security clearance to serve in this job. But an affinity for treating patients, a focus on algebra and science as part of high school coursework and a general sense of the traumas of combat on soldiers' mental health will serve you well. You'll be well qualified for a variety of careers in the civilian mental health sector. You could pursue a career path as a mental health and substance abuse social worker, as a psychiatric technician, or a substance abuse counselor. You could also work as a behavioral disorders counselor.